I always knew the day would come that the childhood myth of Santa would have to be revealed to my children, and this weekend that day arrived. While sitting down at the dining table our eight year old daughter posed the question “Is Santa real?”. This was an easy question to answer as we’ve been asked this before and always relied on the good old “If you believe” style answer – but that day the questions continued and the skepticism grew. She and her nine year old brother continued to ask more direct questions and would not accept the half answers we were providing. Of course, we were using full on deflection techniques as we did not want to outwardly lie to our children, so we continued our attempts to deflect, distract, and change the subject, but weren’t able to do so. We ended the conversation without any real answers, but no one felt satisfied either. That evening my husband and I sat down and discussed the matter. 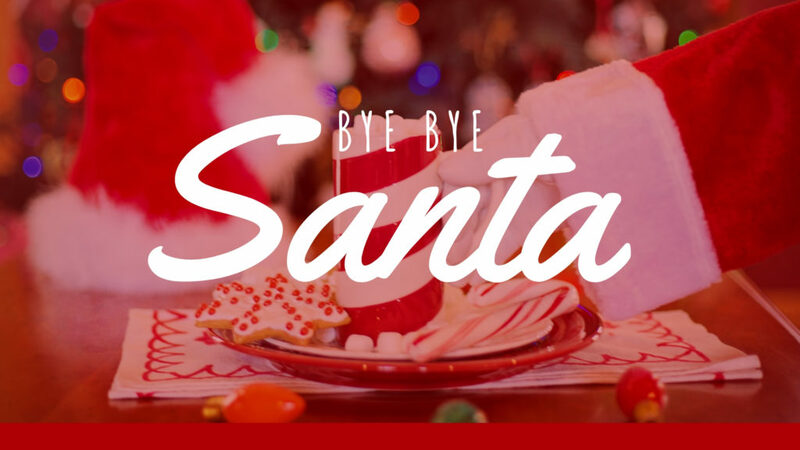 We googled the appropriate age to tell your children about Santa and ways to go about it. 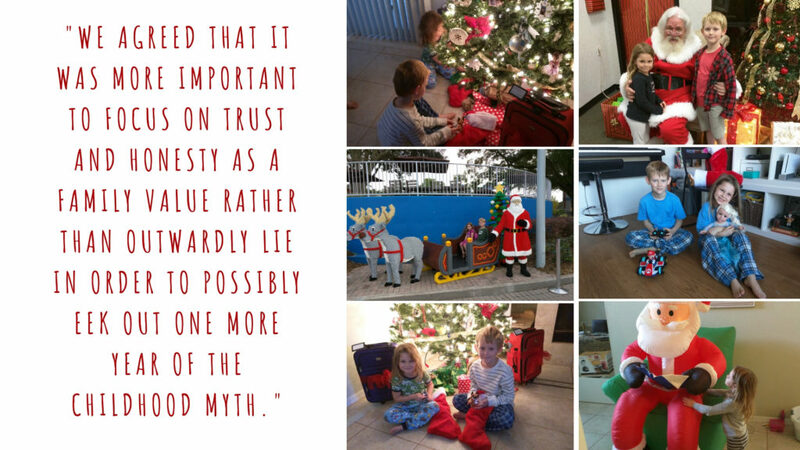 We agreed that it was more important to focus on trust and honesty as a family value rather than outwardly lie in order to possibly eek out one more year of the childhood myth. I will not lie. I was sad – and I’m still sad in this moment. The idea of Santa has brought so much joy to the holiday season, and I think I enjoy being Santa even more so than I even enjoyed his arrival during the Christmas season during my own childhood. I was really good at being Santa. I would keep notes all year long regarding wishes and thoughts about what they would like so that come Christmas morning, they had their hearts desire and not just the hot new toy that they learned about via holiday commercial on television a few weeks prior. Even when I get them spot on birthday gifts, it did not bring the same level of joy and amazement as it did when a jolly old man in a big red suit brought them the perfect Christmas toy. The next morning we sat down for breakfast and approached the subject. We told them that we were willing to unveil the complexity of Santa, but that they needed to make the decision whether or not they truly wanted to know how it all works because once they decided to know the secrets, they could never go back. We tried to word it in such a way that left believing for one more year on the table. My eight year old daughter decided she wanted to stick to believing, but my nine year old son asked to be let in on the inner works of the North Pole. We took him into the bedroom, sat him down, and dished it out. 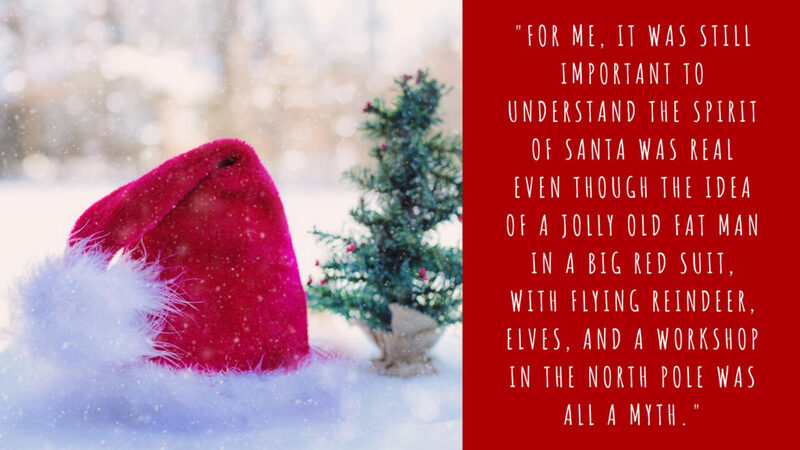 For me, it was still important to understand the Spirit of Santa was real even though the idea of a jolly old fat man in a big red suit, with flying reindeer, elves, and a workshop in the North Pole was all a myth. Yes, parents played out the role of the gift giver, and yes, we ate the cookies left out on Christmas Eve, but I truly believe that the Spirit of Santa helps guide us to the perfect holiday gifts. It allows parents to tune into the wishes and intentions that their child has placed out into the universe and follow through with the manifestation of their dreams. I believe in the law of attraction and I think that the Spirit of Santa is just this – kid style. We have always had a pretty strict – Santa does not do electronics – policy in our home and so the kids knew that this was not something on the table come Christmas time. The kids also understood that Santa does not perform miracles – creating siblings, bringing dogs, or resurrecting the deceased – but rather that the gifts Santa brings would need to be created at his workshop. As parents, we created the constructs of Santa to fit within our gift giving parameters. At the beginning I tried to give gifts that looked hand constructed (i.e. a stone handle magnifying glass, a hand carved jewelry box, etc.) but this proved to become more challenging as the years passed, so we simply stuck to the no electronics rule with an attempt at more basic toys (i.e. dolls, toy cars, dinosaurs, etc.). Most years, I have done well on the Santa gifts, but one year, the year we were preparing to sell our home in Florida and move to DC, I really failed. The stores just did not seem to sell the items that the kids dreamed of. I did my best, but Christmas morning ended in some major disappointment. The following year, the kids did not seem to have any true longings for their holiday gifts, but I was terrified that I’d let them down two years in a row. In true Santa Spirit though, the universe aligned and provided me with exactly what they had wanted the year before in perfect form. I had never seen either product before in my life – one being an American Girl style Elsa doll and the other being a Super Mario Brother’s Remote Control Car. The crazier piece is that there was only one of each (different stores, different shopping dates) and I have still not seen these toys for sale again to this day! 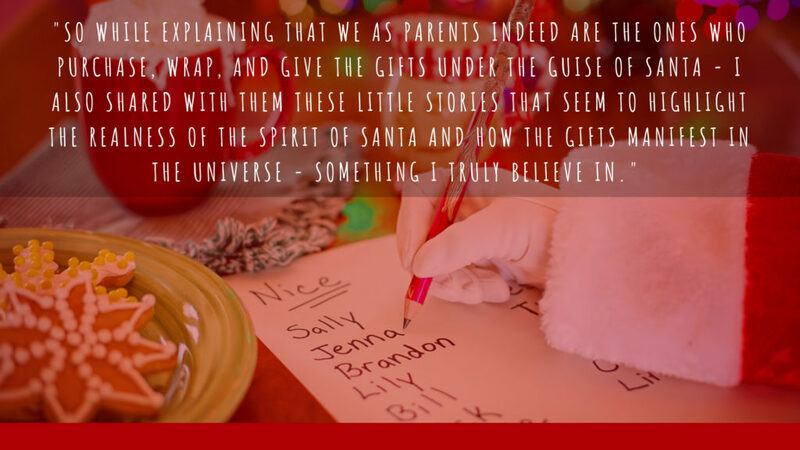 So while explaining that we as parents indeed are the ones who purchase, wrap, and give the gifts under the guise of Santa – I also shared with them these little stories that seem to highlight the realness of the Spirit of Santa and how the gifts manifest in the universe – something I truly believe in. This gave them something more to hold onto. I also explained that as long as they believed and put the energy out into the world, that they’d still receive their Santa gifts. My two children reacted completely opposite. My daughter seemed relieved to know the truth and really held onto the way I explained it with belief still in her heart, while my son seemed completely deflated and could not shake his sadness even through the next morning. He also asked about the Easter Bunny this morning (palm to forehead). I know this is a right of passage as a parent, but there doesn’t feel like any right way to do this. Only time will tell how Christmas plays out this year, but Santa will be delivering their special gifts regardless. I’d be curious to hear your stories of unleashing the truth behind Santa and how it played out in your own lives. As always, thanks for reading!